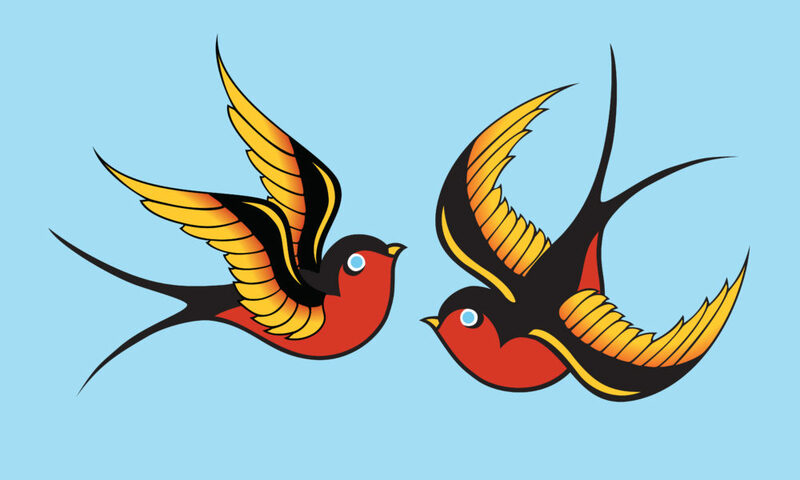 I finished this digital illustration of a pair of swallows last week. The inspiration was Sailor Jerry style, vintage inspired tattoo design. Because of the long distances they travel, sailors would get a swallow tattooed on them after sailing more than 5000 miles, or a pair after 10000, or after a particularly perilous trip. The also represent love and coming home. This was a pretty quick illustration for me, I worked at it a little each day for about a week. Then once I figured out how to draw one of the wings it all came together and I spent an afternoon locked in my office finishing it. I’m pretty happy with this, I like the simplicity and the bold colors. I’m considering doing some more tattoo inspired pieces, maybe a dragon or a mermaid. This entry was posted in Illustration on March 9, 2017 by RyanMcGurl.